This morning I built the Website Budget Calculator. This tool is meant to be used as a way for potential clients to work out how much they should invest in their website – based on the value based pricing approach. I’m interested in, but sceptical of, value based pricing. I’ve listened to talks and podcasts, read books, and generally given it lots of thought. The Website Budget Calculator is a way of explaining the idea to myself as well as my clients. I hope that the website can generate some discussion and solidify some ideas and best practices around the subjects of web budgets and value based pricing. Please comment below or tweet me @keithdevon. Today I added a line to my contact page stating that my minimum budget for a new project was £2,000. I wanted to explain why I’ve done this. I’m in the privileged position of getting lots of enquiries for new work. Some days I get up to five enquiry emails. I’m so grateful for this. I’ve worked hard to get to a point where this is the case, and I don’t take it for granted. When I started out, I was building sites for hundreds of pounds. I thought, “how can these agencies be charging so much for these websites?” Over time I learnt why. Good web design takes time, and therefore money. It is possible to put a website together in a matter of hours. Tools like WordPress make this possible, and I love it for that. However, I’ve chosen to take a different path, one where design decisions are based on research, planning, testing and collaboration. These things take time, and money (you get the point now!). From a technological point of view, web design is getting more complex. Responsive web design (RWD) is the way forward, but it adds more steps to your process – more research, wireframes, mockups, development, iterations, testing, etc. I would estimate that a responsive site can (should?) easily double the cost of a website, if not more. I like to respond courteously to every enquiry that comes my way. You never know what being nice to someone might lead to. All those replies take time though, and that time is starting to build up. If I give out that budget info up front, it saves them time not having to fill out the enquiry form, and it saves me time in responding to the email. Win-win. When a job comes in that I can’t take on, I send them to the WordPress London meetup group, where they can post the job on the discussion forum. There are people there with different skills, experience and interests, who might love the chance to work on those jobs. Lower budget work can be very rewarding, if you’re working with the right people on the right projects. Hopefully that helps to clarify why I’ve set a minimum budget. It might all backfire – who knows? – but for now it feels like the right thing to do. Contracts are a hotly debated part of the freelance workflow. Many people don’t use them at all. Others will swear by them, and never start a project without one. Where do you stand? Do you use another method? Add your thoughts in the comments. On 8th April I gave a talk at the Untangle the Web meetup at Google Campus in London. As a freelancer there is a lot of advice out there, especially in the web industry. You’ll probably have heard some of these tips before, some might be new. They’re not necessarily the best, or most important, they are just the ones that have made a positive difference in my short career. I hope they can work for you too. Going right back to the beginning, the term ‘freelance’ was first coined in 1820 by Sir Walter Scott. He used it to refer to a mercenary, literally a free lance, or a soldier that wasn’t allied to a particular monarch. Today’s definition of freelancing is blurry. At it’s most simple, it means someone who has multiple employers. It can also be very rewarding. It’s very satisfying when the hard work, to find and do great work, pays off. I think that this is where most people struggle. They put all their time into improving their key skill set and forget about these auxilliary, but essential extras. As a freelancer there is no monthly paycheque, unless you’re on a long term contract. This can make it very difficult to plan your business and personal finances. Also, try applying for a mortgage! Smoothing out the typical boom and bust payment structure is essential. I find this one really difficult to manage. Sometimes I love being able to sit at home, put my head down and put in a good day’s work. Often though, I really miss having people around me. People to share triumphs, frustrations, idle chat and ideas with. It can be a very lonely career path. Let’s have a look at some ways that we can hopefully leverage the positives and reduce the cons. I started my web career as a ‘web designer’. I knew some HTML and CSS and I wanted to build websites for people. Turns out that I wasn’t alone. In an effort to find work I signed up to a few job boards and freelance directories. I used “People Per Hour” a lot. There were loads of jobs posted on there that I knew I had the skills for. But every time I submitted a bid for a job, so did 100 other ‘web designers’. My odds weren’t good. I was spending too much time writing proposals that weren’t going anywhere (mostly because I was being undercut, but we’ll get to that). The turning point for me was when I started using WordPress. Once I’d built my first WordPress site, I was hooked. After a couple of sites I added ‘WordPress development’ to my list of skills. Suddenly, instead of looking for projects, people were approaching me. I changed my title to ‘WordPress developer and web designer’ and I received even more enquires. That trend has continued. So what happened? As a ‘web designer’ I was competing with a huge number of people and companies, using a very generic skill. What is ‘web design’ anyway? Is it producing wireframes? Designing mockups? Front-end development? Building full websites? As a ‘WordPress developer’ I had a much clearer skill. People that had, or wanted, a WordPress website would see that I knew how to work with the platform. Finding a niche isn’t limited to niche skills. It could be a niche industry (‘web designer for bands’), a location (‘Camden front-end dev’), personality trait (‘friendly UX consultant’), style (‘I like building funky, colourful websites! ), anything. If you can combine a few of these, then great. Just be careful of not being too niche. There might not be a huge market for “funky pet profile websites in Islington”. I once met a potential client who, after agreeing to hire me, said, “I nearly didn’t call you, you’re too cheap to be really good at what you do.” That bit of rare honesty had a big effect on me. How much potential business had I lost this way? Will raising your rates actually bring you more enquiries? Is the work that you’ll miss out on the type of work that you want? I would suggest the answers are yes and no. In my experience, every time that I’ve raised my rates I’ve noticed a drop off in the total number of enquiries, but an increase in the number of higher quality leads. This means that I spend less time on the ‘can you build me Facebook for £500’ enquiries and more time on the serious projects with sensible budgets. If you are competing on price alone, then everybody loses. You’ll end up being stressed and resentful of the tiny budget, and your client will be disappointed by the rushed job. Also, your portfolio will never have anything decent in it, therefore making it difficult to attract the better clients. You’re now an expert in your niche, so your rates should reflect that. After all, people know that if you pay peanuts you’re probably eating horse. Jeff is a middle-weight front-end developer. He might be able to attract a full-time salary of £35,000. As a freelancer,his expenses for the year might be £5,000. He might work about 45 weeks in the year. Sometimes he’ll be between contracts. That comes in at 1,350 hours of work in a year. His hourly rate would have to be around £30. A daily rate of £240. An expert in London should be charging at least this amount. Maybe more depending on your level of expertise, skill set and industry. Crap, low-budget work leads to more crap, low-budget work. We touched on this vicious cycle earlier. There’s a bit more to it though. I was inspired by Andy Budd when I went to see him talk at the London Web meetup. He was giving at talk called “7 tips from 7 years running Clearleft”. One of Andy’s tips was to have at least 6 months ‘in the bank’. The idea behind this was that you would never get to the stage where you had to take on work. You’ll have been there before. The end of your current project is approaching and you have nothing lined up. A job appears in your inbox. The budget is tight and the project isn’t well thought out, but you have bills to pay so you accept it. The job turns out to be worse than you imagined. It drags on and you have long since lost any kind of profit. To make matters worse, while you’re in the middle of it your dream client calls with a project starting next week. You have to turn it down. If you could have held out for a week or two, with no work, you could have taken that dream job. OK, so maybe your dream job wouldn’t have come along. The point is though that it pays to be picky. You won’t win great work with crap stuff in your portfolio. This is one of the most common bits of advice, and for good reason. Contracts not only give you something to fall back on when things go wrong, they also help to make sure that things go right. A good contract will set expectations and may raise important questions that are better to be resolved at this stage than during a project. Using a contract will also make you appear more professional, because you will be more professional. If you’re scared of contracts have a look at Andy Clarke’s Contract Killer. Another great resource for this area is ‘Design is a Job’ by Mike Monteiro. Have you seen the site Clients from Hell? It’s pretty funny. You’ll no doubt sympathise with some of the designers on there. We’ve all had ‘interesting’ requests. However, this ‘clients are always wrong’ mindset is a dangerous one to fall into. The client blaming culture in our industry is getting out of control. I think that it’s time to take some responsibility for when projects go bad. From my point of view, there are many more bad project managers than bad clients. There are bad clients out there, but using tips 2 and 3 should help you weed those guys out. Hey Mike, Here’s the design I’ve been working on for three months. What do you think? You tend to get the feedback that you ask for. Since I listened to Kieran O’Shea’s talk at WordCampUK, I’ve been taking security much more seriously. Kieran had some pretty scary statistics regarding hacking. For example, 90% of all businesses have been hacking victims in the last 12 months, and, there is an average of 156 days before victims realise that hacking has taken place. Having your site hacked is bad news. There are many ways in which a site can be hacked, and many outcomes, but be assured that none of them are pleasant. Luckily there are things that you , as WordPress site owners, can do about it. Don’t use ‘admin’ as a username. If you have a user called ‘admin’ set up a new user with administration privileges and then go and delete the ‘admin’ user. Do it now! Since my PayPal incident I’ve started to use unique passwords for nearly every site that I use. I know that it sounds daunting, but there are ways to manage passwords (check out 1Password). Keeping up to date with the latest version of WordPress and especially the security patches is my next biggest tip. As of writing WordPress is at version 3.4.1. They are constantly releasing security patches and other major upgrades. Keep ahead of the hackers by having the latest version installed. Warning: back up your site fully before installing updates, especially point releases, i.e. moving from 3.4.1 to 3.5. Sometimes upgrades will break your themes or plugins. This is just the way it is. Nobody can predict the future, but the best themes and plugins should be more future proof. If you run into problems with upgrades, revert to your backed up version and contact your WordPress professional. Ideally, have your pro do the upgrade, testing and bug fixing for you. I will be offering my clients upgrade services. Please contact me to discuss upgrading your site. If you need help or advice regarding security please get in touch. What does “affordable web design” mean? So, affordable web design means a web design that is within one’s financial means. Right? I think that what people normally mean by affordable is “cheap”. After all, how can anyone else know what is affordable to potential customers. What is affordable to one business or individual could be out of reach for another. What we really need to be offering as web designers is “value”. But this is tricky too. Value is subjective and people put value on different things. Value is always a function of cost. A product loses value as it’s price is increased (over-priced art work excepted). Set against that cost are all the things that you do as a web designer. Customers will assign value to things like speed, communication, design, friendliness, proximity and many more factors. It’s up to us as designers to try and discover what these values are and then deliver on them as best we can. I try to deliver on “quality”. This means that I’m rarely the cheapest option. I try to work with customers who put a high value on good design and coding rather than price alone. For me this means happier clients and a happier work life! As a web designer living in East London I recently decided to take a look around at the local scene. 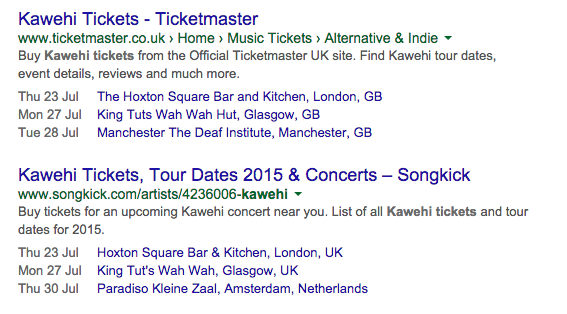 A Google search for ‘web design east london’ returns lots of hits and as always the style and quality of the sites varies dramatically. Just for fun I’ve decided to rate the first five entries on google. I will rate the sites based on 5 categories: usability, portfolio, information, design and ranking. Usability refers to how easy it is to find important information and navigate around the site. Good usability includes having a clear and intuitive navigation system, having text that is easy to read, and prominently displaying important contact information. This is highly subjective. I will look at the sites displayed on their portfolio and quickly judge the quality. Although the quality of a site can’t be truly gauged from a quick glance, on the web that is all the time you are allowed. On the web content is king. A site is nothing without information, it is after all what your users are after. I will be looking for information about pricing, best practices, company history and employees, etc. I also believe that it is important to try to educate clients on web design best practices, and will look for evidence of this. Again this is highly subjective. I’m not just looking for pretty graphics, a strong layout that displays the content in an easy to digest way is more important. Deign principle such as layout, colour theory, unity, balance, typography, etc. will all be examined. Lastly I will allocate points to each site based on their Google ranking. This deserves to be rewarded as it is not easy to obtain high positions in search engines. Especially for competitive terms. This site is a real mixed bag. I’m not sure that the company still operates as the latest news story is from 2007. The first impression isn’t great. The layout of the page is uncomfortable. It is aligned to the left of the screen and the background image doesn’t fill the viewport. The page content just falls off the bottom into white space. The strange Flash backgrounds I found distracting and a little amateurish. The colour scheme doesn’t work well for me either, the green and red just don’t cooperate. From a usability standpoint, the text is a little small but the main nav is clear and intuitive. Text is generally easy to read despite the size). Unfortunately, a couple of pages have broken navigation sections where there are clearly some coding issues. There is plenty of information on the site. There are lots of examples of their work. Unfortunately, I felt that most of the web designs were a bit out dated and some sites don’t work at all. I only checked the web design section, as anyone searching ‘web design east london’ would be looking at this category. 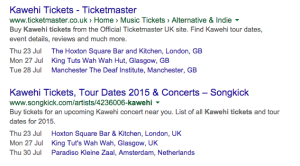 Although not actually based in east london, minttwist have done some clever SEO to get right up to the top for this search term. First impressions are good. The site is packed with information but it doesn’t feel too cluttered. the home page features core services, ‘why choose us?’ and ‘Our Goals’. The main navigation is detailed and well organised. Usability on this site is great. It’s easy to get around, easy to read and there are few distracting graphics. When I clicked on Web Portfolio I was taken to the Portfolio page. From here I clicked again on Web Portfolio and was then taken to an error page. When browsing the portfolio I was sometimes directed to the wrong website, or to an error page. Aside from that, these guys have some impressive clients on there. For my tastes the designs are a little generic. minttwist has loads of information on the site. It is all easily accessed from the main nav bar and contains links to some useful external resources. I touched on the site design earlier. It’s nice and clean and well organised and structured. However, I found it to be lacking any personality or creativity. It’s a bit too standard looking, with very little to set it apart. I’m not sure what to do about this one. The designer has re-branded and you are now asked to go through to the new site. How many people will do this? I’m not sure. Ok, I’ll be nice and review his new site, frishmedia.co.uk. Usability is good. The site is simple and very easy to navigate. Despite being light on dark, I found the text easy to read. The portfolio is ok. He has lots of designs to exhibit and I’m sure some will enjoy the scrolling mac style viewer. Again, I found the sites on there to be a little generic with lots of stock style imagery. This is potentially down to low budgets. This site isn’t packed with info but all the necessary information is included. He has included his terms and conditions which I liked. It shows a degree of openness and transparency. I like the design of the site. the colour scheme is really eye catching, the layout is simple and consistent and graphical elements are subtle and stylish. This site is a mystery to me. Firstly the name ‘visualeze’ suggests that things will be easy. They won’t. The usability on this site is seriously lacking. What I thought was a difficult to read main nav, turned out to be tag lines and not navigation at all. There seems to be some effort to be highly accessible, which is commendable, but I was confused with the numbers and letters beside the nav items on the left. The sections are very confusingly named. For example I eventually found the portfolio under ‘Creativity’. Once there, there were only four examples of websites and they were predictably poorly designed, with no information on the projects. 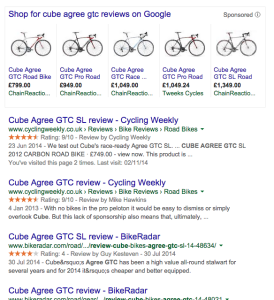 There is a fair amount of information on the site, from ‘Hosting’ to ‘Pay per Click Advertising’. Again though, these are listed under strange headings like ‘Productivity’ and ‘Communication’, instead of something like ‘Our Services’. The site is really let down by the design. It looks like it could have been designed using MS Word. There is a loose colour scheme based around black and orange but then there are weird additional colours like the maroon and light blue. Layout is good and the style is generally consistent and there are no distracting visuals; so overall readability is good. We’re ending on a high here. Touch Taboo is a really good example of an agency site. The site is easy to navigate with a simple and well positioned main nav. The white background and dark text makes sure the content is legible. The portfolio is the best of the bunch. The image viewer looks great and the work that it displays is of a high quality. My only issues here are with the lack of any project information, and that the image browser arrows are hidden until rollover. There isn’t much information on the site. Not necessarily a bad thing as it is straight to the point and people’s attention spans on the web are notoriously short. A bit more detail on the portfolio pieces would have been useful. The blog does contain some good articles for potential clients and social integration is obviously something the designer has embraced. The design is very current. It is nicely structured, the colour scheme is strong, the images are bold and colourful and the typography is well executed. My only real criticism is that it is a little too ‘safe’ and unoriginal. Again, not necessarily a bad thing, many clients will be attracted by the corporate feel. It was a close run thing at the top. The top three sites were all good. Iamhuman was saved by it’s high ranking but I think that it and visualeze could really improve with not much effort. I guess all this sounds a bit arrogant. What qualifies me to sit here judging my peers? Nothing really! However, I did find this to be a really useful exercise in critical analysis of websites. I’ll have to take another look at my own site and see where I can improve based on these criteria. Fancy taking me down a peg or two? I would really like to hear your feedback on this. Do you agree with me? Are you one of the site owners? What do you make of my site? Please use the comment form below. All sites viewed in Firefox on Mac OSX. These are the personal opinions of Keith Devon and are only a superficial and subjective view on the sites examined.